Wellspring is adding Equine Assisted Psycho-Therapy (EAP) and Equine Assisted Learning (EAL) to our services. Learn new life lessons, find healing from traumas, or develop new relationship skills, while enjoying the relaxed environment of horses. Horses are sensitive. They read our emotional states, sense our heartbeats, feel our energy levels and then relate to us accordingly. Horses are social. They want to know who is the leader, they want safety, and they want relationship. This gives us endless opportunities to practice our skills of providing these things, with instant feedback and rewarding relationships. Horses live in the present. They respond to what we do now, not what we did in the past or may do in the future. They give us opportunities to change and to practice new behaviors. Horses are honest and they are big. We can’t manipulate horses with our words. They do not lie to us, and we cannot lie to them. They give us honest feedback that we can apply to our lives. People enjoy the process of hanging around horses in a relaxed, non-threatening therapeutic environment. Walking around an equine facility and assisting in horse grooming or horse care all provide for horse fun. This opportunity invites clients who might otherwise be resistant to therapy to engage in a new learning experience. EAL includes the client and an Equine Specialist who is trained in Equine Therapy. Wellspring clients will make treatment plans with their therapists regarding areas of growth or learning that they want to achieve. Those goals are then shared with the Equine Specialist who will work with the client to achieve some of those objectives in an active learning situation with a horse. Horses become co-participants in the therapy and add fun to the experiential learning of skills such as body awareness, problem solving, leadership skills, confidence building and more. EAPR includes the client, an Equine Specialist and a Therapist. In this situation, the client works un-mounted (on the ground) with a horse in a round pen. Both the client and the horse are “loose” (no bridles, reins, etc.). 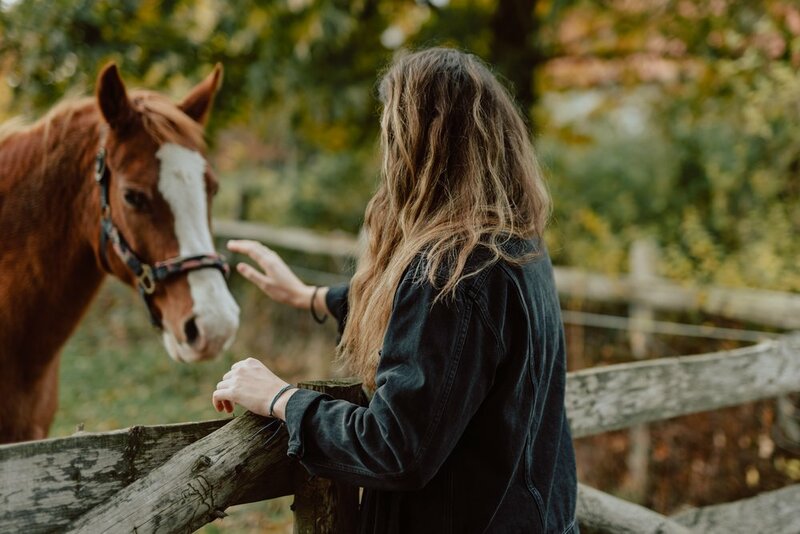 With the encouragement and direction of a therapist nearby, and the safety and horse insights provided by an equine specialist, the client practices his/her relationship skills with a horse. The client may identify his/her personal relationship patterns and their usefulness while working with a horse. This process allows for new relationship skills to be developed in a real situation. As the client practices these new skills, the insights and skills quickly translate to improving human relationships. TF-EAP also includes the client, an Equine Specialist and a Therapist. Clients work to resolve negative life experiences and traumatic events while riding a horse, with the therapist walking along side. This specialized trauma therapy, using EMDR protocols, provides a physical experience beyond intellectual awareness, as the horse and therapist become caretakers and witnesses to the remembering and telling of an event in order to bring about healing. Rhythmic Riding is mounted work with the assistance of an Equine Specialist. The purpose of this work is to help the client improve skills in self-regulation. In order to handle any stressful situation in life well, one must stay in his/her “thinking brain”. Self-regulation means the ability to stay in control of one’s breathing, state of calm, choices of responses and the use of all parts of the brain (thinking as well as reactive parts). These skills and neural-network patterns can be readily learned, if intentionally addressed while riding a horse, because all parts of the brain are activated simultaneously. EAL sessions cost $75 per session (about an hour). Group EAL sessions may be available in the future. EAPR and TF-EAP sessions cost $240 per session (about an hour). If your health insurance has coverage for mental health services, the therapy portion of these costs can be billed to your insurance. We currently do not have any scholarship funds available to cover these expenses. We are soliciting grants and hoping to find donors who are willing to provide these scholarships, particularly for children who have been traumatized, in order to make these services available to those who can benefit greatly from them. If you are willing or able to contribute toward these funds, please do so. Sessions may be scheduled through our main office number with any of our trained equine therapists. Liability Forms. Click here to download the Wellspring form and here for the Whispering Manes waiver. Please bring both forms with you signed. Attire. You should wear closed-toed shoes to the barn for safety, boots if possible but tennis shoes will do. And don't forget your sunscreen and/or a hat. Our equine therapists are professional therapists who are also trained in providing equine assisted psychotherapy. We have all received our training in Natural Lifemanship from Spirit Reins in Austin, Texas. www.spiritreins.org This is an established program providing equine assisted therapy, primarily to children in foster care. Because of the success of their work, they maintain a full case load and a long waiting list to participate in their program. We intend to build a similar model here in Miami. See video of their program.